Last weekend, I took advantage of the cloudy weather (and the soft diffused light it produces) to hike around, explore, and photograph Oswald West State Park in the northern coast of Oregon. I was initially attracted to this place because I had read that it had a wonderful grove of giant spruce trees. 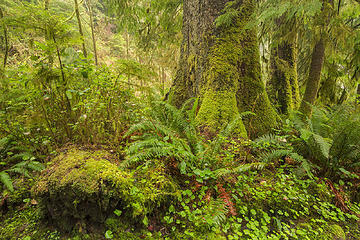 A short 10-minute drive from Cannon Beach, Oswald West State Park shares much in common with its southern neighbor, Cape Perpetua. 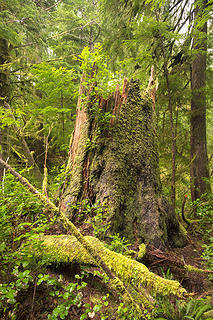 Both are coastal parks dominated by old-growth Sitka Spruce forests, which grow near streams that flow into the ocean. Unlike Cape Perpetua, however, Oswald West contains tall rock cliffs, eroded over millennia by the constant pounding of the ocean. Though I found that most tourists visit the park primarily to hike the dramatic, cliff-hugging Cape Falcon Trail, I was more interested in several of the park's more accessible trails that traverse the lowland forests near the southern parking lot. 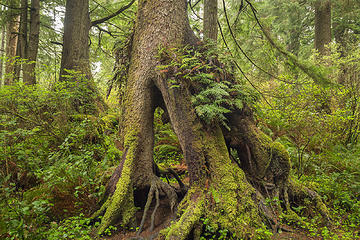 These short trails offer some of the best old-growth hiking in coastal Oregon. The watershed between Short Sand Creek and Necarney Creek is filled with giant trees contoured into weird and interesting shapes. The whole area is incrediblly verdant and brimming with vegetation. 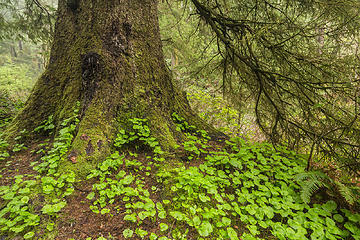 Various short trails intersect the forest and for much of the year, small green plants dominate the forest floor, growing around the ancient trees. Overall the park is a fantastic day-trip. This visit was part of my attempt to slowly build a comprehensive online resource on Oregon's ancient forests found here: http://www.lucascometto.com/cascadia-oregon and all of Cascadia in general: http://www.lucascometto.com/cascadia. Hope you enjoy it! Short Sands Beach is a neat spot, been there several times in recent years. Hiked out to Cape Falcon probably 7 or 8 years ago. Pretty much anywhere along the Oregon Coast is delightful. Thanks for the TR. olderthanIusedtobe, it's absolutely a great spot. Wonderful coastal views and beautiful uncrowded beaches. Glad you made it out there - you should return again!